Please fill out this form and click submit. Thank you! 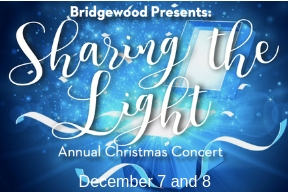 Please join us for Bridgewood's musical celebration of Christmas! Concert begins at 7:00 pm. Tickets are $5. A silent auction on Friday evening begins at 6:00 pm. All proceeds help fund a Bridgewood Church and Scott County Wyldlife staff position reaching middle school students in our region.